Science fiction, horror movies, action flicks. I love movies from the 80’s. They’re so outlandish and different from films nowadays, they were more creative and immersive with their ideas and characters and story. One artist that I’m currently loving to death brings all of that front and center, grabs you by the throat, tells you everything, and doesn’t let go until its time to get right up in it. His name is TimeStalker. 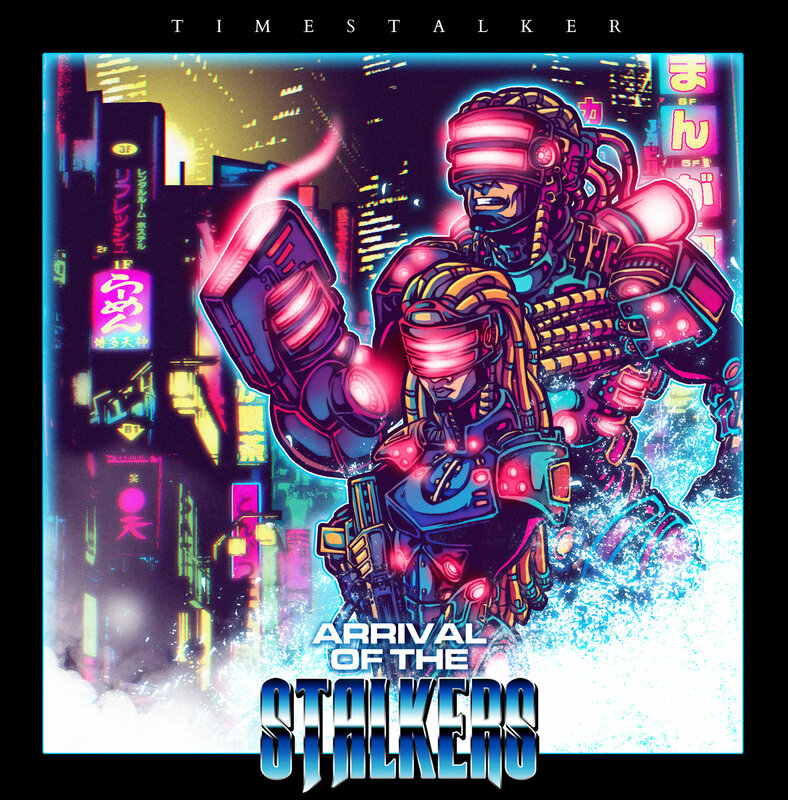 TimeStalker has been around for a bit, releasing two singles named “Street Prowler” and “Firestarter”, as well as a cover of Tim Feehan’s “Where’s The Fire”. However, recently (as in today), he just dropped a debut EP on Werkstatt Recordings (thanks for the PURGATORY tape guys, luv ya :3) entitled ” Arrival Of The Stalkers”. This is how you make a movie soundtrack without actually making a movie, its a masterful release, but enough chitter chatter and pitter patter. Time to wake up and smell the smoking gun. The title track is conveniently the first track, “Arrival Of The Stalkers”. We hear police sirens, and opening narration stating what’s known: a city under siege by rampant crime. The opening narration from “Vigilante” really throws you into the darksynth soundscape, like bolting through a dark alleyway or a chase on an abandoned freeway. Its full of speed and pace, it never lets up. “Rise Of The Pariah” has to be my favorite track on the album, which is also the second track. Its the first single from the album when it was announced, and The 80’s Guy on YouTube even made a music video with the song. Getting on a channel like that, neros77, or NewRetroWave takes supreme talent, and it shows through this song. Its like a trailer theme for Lethal Weapon or Die Hard, I’m detecting mass levels of blood and explosions here, it doesn’t go unnoticed. Track number three is entitled “Outbreak Of Evil”, and this is where the album gets really fun. The rhythm fills your head, giving you visions of people held hostage, broken fluorescent lights hanging from the ceiling, doors violently ripped off the hinges the bad guys wasted and brutalized and laid out to die. Who’s responsible, you ask? The futuristic crime unit known as the Stalkers, the ones sent back to save the world by saving just one city. It could change humanity for better or worse, you dont know their true intentions, their songs are misleading and dark in nature but their deeds are in the name of good. “Call For Vengeance” signifies the halfway point of the album, aka track number four, and leads into the action very nicely with buildup. It totally fits the retro action movie vibe that is needed in the synth scene today (that, and more ninjasynth). Its a desperate prayer for revenge and help. Who better to answer than the Stalkers? Track number five is possibly the most loud, fast, and dark song there is on the album, and its name is a clear indication of that, “Ultra-Violence”. The climax begins here, a corrupt branch of the police has taken over a skyscraper party, and the Stalkers grab their futuristic gadgets and put them to good use. Instantaneous teleportation, light-speed jetpack, thermal vision goggles with x-ray capabilities, targeting system, and best of all, infinite ammunition. Bullet holes? What bullet holes? Blood? I see a river of yours, not mine. Its a perfect action climax track. Finally, we come to a close with the final track “The Last Survivor” (warning, time to get fictional). A bloody hand barely raises above all the carnage and destruction. The last corrupt officer, dressed in full riot gear, wasn’t prepared for what would occur. He wouldn’t have stopped to consider that a three man group from the future would invade HIS city, fix HIS damages, let alone save the hostages he took. One of the Stalkers leans over him and grabs his wrist, snapping it like a pencil. He would scream, but a shotgun barrel is in his mouth. His eyes are his only communication, within them contains fear and hatred. The last thing he sees is a word being mouthed by one of the Stalkers. “Boom”. The song is relentless in it’s audiovisual onslaught, the album in itself is a musical massacre of the 1980’s brutal action flicks, and you need to go listen to it if you’re a fan of anything retro, I implore you to.